This beautiful round table set has it all; a beautiful pedestal metal base which matches the metal base of the chairs, and a cherry finished round table top with a tempered glass insert in the middle. 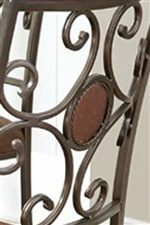 Through the glass you can see the beautiful ornate metal details surrounding the faux leather center which also matches the chair's metal design. When all these details come together it creates a truly exceptional set. The Toledo 5 Piece Dining Set with Glass Insert by Steve Silver at Walker's Furniture in the Spokane, Kennewick, Tri-Cities, Wenatchee, Coeur D’Alene, Yakima, Walla Walla, Umatilla, Moses Lake area. Product availability may vary. Contact us for the most current availability on this product. The Toledo collection has something for everyone. Wood, glass, metal, upholstery and faux leather are all used to create a unique collection. A beautiful pedestal metal base matches the cabriole metal legs of the chairs, a cherry finish on the round table top with a tempered glass insert complements the colors of both the upholstery and metal. 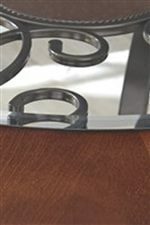 Through the glass you can see the beautiful ornate metal details surrounding the faux leather center which also matches the chairs metal back design. All of these details come together and create a truly exceptional dining experience. The Toledo collection is a great option if you are looking for Transitional furniture in the Spokane, Kennewick, Tri-Cities, Wenatchee, Coeur D’Alene, Yakima, Walla Walla, Umatilla, Moses Lake area. Browse other items in the Toledo collection from Walker's Furniture in the Spokane, Kennewick, Tri-Cities, Wenatchee, Coeur D’Alene, Yakima, Walla Walla, Umatilla, Moses Lake area.